I'm looking to make a CD of songs from my show BEFORE the actual staging of it (a la Jesus Christ Superstar and Evita) to help with the promotion and casting. There are 12 different singing roles, male and female of varying ages. 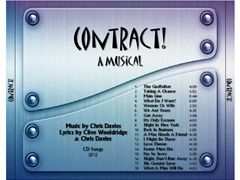 You can hear some of the backing music on my audio: 'CONTRACT! Overture'. Your recording can be done remotely with your own equipment or any studio available to you. You can obviously therefore be located anywhere in the world. There is no payment at the moment but of course you would have first consideration in any future professional stage or recorded production. 22 great songs in styles including rock, jazz, bluegrass and even dixieland have already been written and arranged! There are ballet, latin and Irish dancing numbers featured and it's got a cracking storyline too! The lead character is a frustrated businessman who thinks he deserves more from life. He is made 'an offer he can't refuse' and starts his rise to riches and power. It is though, in reality, a slippery slope to self loathing and wretchedness. Will he face a miserable fate or will he redeem himself? Actually there are 16 singing roles!